Texas Knifemaker's Supply is a full-time knifemaking supply and service company located in Houston, Texas. Once again, we are offering you a bigger and better website complete with our fully stocked Online Store. We have scoured the world over to bring you the most comprehensive knifemaking supplies available. Our products are of the finest quality and our service is unmatched. Plus, we don't just stock our products ... we also use the products we sell! By using these products, we can offer you expert advice that is based on our years of experience. We can also advise you if a product does not meet our requirements, or how to make a product work properly based on the application. Our technical expertise is for knifemaker's ... by knifemakers! Our company is built exclusively around the industry we support. We perform our own "in-house" heat treating service, and offer (DCT) Deep Cryogenic Tempering. We test every blade for hardness ... before it is sent to you! If you have a question, or need further technical information about these custom services or one of our many products, please call Toll Free at 1-888-461-8632 or e-mail us and we'll be glad to assist you! We appreciate the opportunity to serve you and we will continue to offer you the best in services, blades, knifemaking equipment, handle materials, steel, compounds, and everything else you need to make the highest quality custom knives! We'll constantly be updating this site as we bring new and exciting products to the market. So, make sure you bookmark this site and check back often. We serve knifemaker's worldwide! Our Online Store represents the best in knifemaking industry supplies that is currently available on the internet. As always, our latest full catalog is available directly from this site. If you would like a workbench copy mailed to you, please fill out the convenient e-mail form located on this site and we'll ship you a free copy. Please let us know if there is anyway we can be of assistance! Whether you live in Houston or you're just visiting the area, we invite you to stop in and see us. Our shop is conveniently located off (Beltway 8 and I-10) in West Houston. 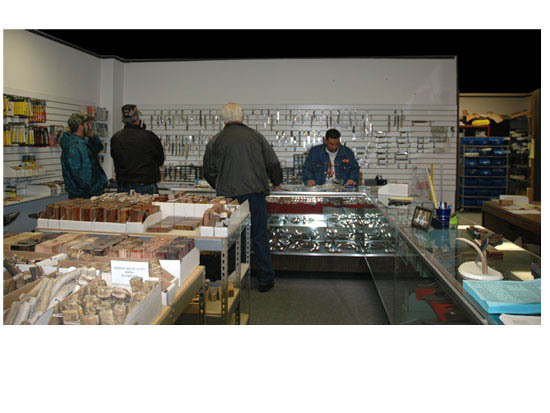 We would appreciate the opportunity to meet you and show you our excellent knifemaking supplies! Plus, we enjoy building personal relationships with the customers we support.